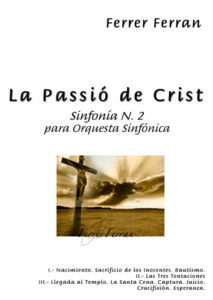 Symphonic Orchestra: La Passió De Crist. 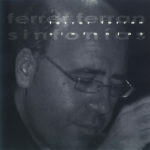 Sinfonía nº 2. – M. 63: Entonces Herodes, al ver que había sido burlado por los magos, se enfureció terriblemente y envió a matar a todos los niños de Belén y de toda su comarca, de dos años para abajo. – M. 123: Y todos los niños de Belén fueron ejecutados menos uno. – M. 129: Entonces aparece Jesús, que viene de Galilea al Jordán donde Juan, para ser bautizado por él. – M.132: Pero Juan trataba de impedírselo diciendo: “Soy yo el que necesita ser bautizado por ti”. – M. 1: Entonces Jesús fue llevado por el Espíritu al desierto para ser tentado por el diablo. – M.5: Y después de hacer un ayuno de cuarenta días y cuarenta noches, al fin sintió hambre. – M. 6: Y acercándose el tentador, le dijo: “Si eres Hijo de Dios, di que estas piedras se conviertan en panes.”. – M. 12: Mas él respondió: “Está escrito: ” No sólo de pan vive el hombre, sino de toda palabra que sale de la boca de Dios”. – M.68: Jesús le dijo: “También está escrito: No tentarás al Señor tu Dios”. – M. 214: Entonces el diablo le deja. Y he aquí que se acercaron unos ángeles y le servían. – M.1: La gente, extendió sus mantos por el camino; otros cortaban ramas de los árboles y las tendían por el camino .Y la gente que iba delante y detrás de él gritaba: “¡Hosanna al Hijo de David! ¡Bendito el que viene en nombre del Señor! ¡Hosanna en las alturas!”. – M. 34: Entró Jesús en el Templo y echó fuera a todos los que vendían y compraban en el Templo; volcó las mesas de los cambistas y los puestos de los vendedores de palomas. Y les dijo: “Está escrito: Mi Casa será llamada Casa de oración. ¡Pero vosotros estáis haciendo de ella una cueva de bandidos!”. – M. 109: Al atardecer, se puso a la mesa con los Doce. – M. 220: Entonces, soltó a Barrabás; y a Jesús, después de azotarle, se lo entregó para que fuera crucificado. – M. 285: Pero Jesús, dando de nuevo un fuerte grito, exhaló el espíritu. En esto, el velo del Santuario se rasgó en dos, de arriba abajo; tembló la tierra y las rocas se hendieron. – M. 298: El Ángel se dirigió a las mujeres y les dijo: “Vosotras no temáis, pues sé que buscáis a Jesús, el Crucificado; él no está aquí, ha resucitado, como lo había dicho. – M. 313: Jesús se acercó a ellos y les habló así: “Me ha sido dado todo poder en el cielo y en la tierra. Id, pues, y haced discípulos a todas las gentes bautizándolas en el nombre del Padre y del Hijo y del Espíritu Santo, y enseñándoles a guardar todo lo que yo os he mandado. Y he aquí que yo estoy con vosotros todos los días hasta el fin del mundo.” . – “See that the Virgin Mary will conceive and give birth to a child, and they will name him Jesus”. – The Angel of the lord appeared to Joseph and told him: “Get up take child and his mother and flee to Egypt; stay there until I tell you otherwise. Because Herode will pursue the child to slay him”. – Then Herode, seeing that he had been deceived by the Wise Men got terribly angry and ordered that all the children below the age of two be slaughtered. – “Get up, take the child and his mother with you, and make your way to the land of Israel, for all those who wanted to take the child’s life are dead”. – So all the children in Bethlehem and its area were slain except for one. – Then Jesus coming from Galilee appears by the river Jordan, where John The Baptist is, to be baptised by him. – But John tries to stop him saying: “It is me who should be baptised by you”. – After being baptised, Jesus came out of the water; and then Heaven came open and he saw the Spirit of God come upon him in the shape of a dove. – And a voice coming from heaven said: “This is my beloved son in whom I delight/rejoice”. – Then Jesus was taken by the Spirit in to the wilderness to be tempted by the devil. – For forty days and nights he fasted, and at the end of them he was famished. – The tempter approached him and said: “If you are the son of god, tell these stones to become bread”. – Jesus answered, “scripture says, “Man cannot live on bread alone; he lives on every word that God utters”. – The devil took him to the Holy City and set him on the parapet of the temple. – “If you are the son of God, he said, throw yourself down; for Scripture says, “He will put his angels in charge of you, and they will support you in their arms, for fear you should strike your foot against a stone”. – Jesus answered him, Scripture says again, “You are not to put the Lord your God to the test”. – Once again, the devil took him to a very high mountain, and showed him all the kingdoms of the world in their glory. ‘All these’, he said, ‘I will give you, if you will only fall down and do me homage’. – But Jesus said, ‘Begone, Satan! Scripture says, “You shall do homage to the lord your god and worship him alone”. – Then the devil left him; and angels appeared and waited on him. – From that day Jesus began to proclaim the message: “Repent; for the Kingdom of Heaven is upon you”. – Crowds of people carpeted the road with their cloaks and some cut branches from the trees to spread in his path. Then cut branches from the trees to spread in his path. Then the crowd that went a head and the others that came behind raised the shout: “Hosanna to the son of David. Blessings on him who comes in the name of the Lord! Hosanna in the heavens!”. – Jesus went into the temple and drove out all who were buying and selling in the temple precincts; he upset the tables of the money-changers and the seats of the dealers in pigeons. – And said to them, “Scripture says, My house shall be called a house of prayer”; but you are making it a robbers cave”. – “You know that in two days time it will be Passover, and the Son of Man is to be handed over for crucifixion”. – In the evening he sat down with the twelve disciples. – Jesus then came with his disciples to a place called Gethsemane. He said to them, “Sit here while I go over there to pray”. – “Up, let us go forward; the traitor is upon us”. – The High Priest then said, “By the living God I charge you to tell us: Are you the Messiah, the Son of God?”. – Meanwhile the chief priests and elders had persuaded the crowd to ask for the release of Bar-Abbas and to have Jesus put to death. So when the governor asked, “Which of the two do you wish me to release to you?”, they said, “Bar-Abbas”. “Then what am I to do with Jesus called Messiah?” asked Pilate; and with one voice they answered, “Crucify him”. – He then released Bar-Abbas to them; but he had Jesus flogged, and handed him over to be crucified. – And plaiting a crown of thorns they placed it on his head. Falling on their knees before him they jeered at him: “Hail, King of the Jews!” When they had finished their mockery, they took off the mantle and dressed him in his own clothes. Then they led him away to be crucified. They made him carry his cross. So they came to a place called Golgotha (which means “Place of a Skull”). – The angel then addressed the women: “You, he said, have nothing to fear. I know you are looking for Jesus who was crucified. He is not here; he has been raised again, as he said he would be. – Jesus then came up and spoke to them. He said: “Full authority in heaven and on earth has been commited to me. Go forth therefore and make all nations my disciples; baptize men everywhere in the name of the Father and the Son and the Holy Spirit, and teach them to observe all that I have commanded you. And be assured, I am with you always, to the end of time”.